If you are designing any type of vehicle, one of the most brilliant tools you can use is the idea of ‘moments’. It allows you to quantify loads on bearings, loads on suspension arms, weight distribution – and a whole lot more. What I’ll cover here is a very basic introduction to the idea – although despite being basic, it’s still information of great use. But if you want to explore the topic more deeply, consult any engineering or physics book on ‘statics’. They pop up on eBay all the time for just a few dollars – it doesn’t matter how old the book is; this topic hasn’t changed in the last 100 years. A ‘moment’ refers to a torque that is being applied, trying to rotate something around a real or imaginary point. Like many definitions, that doesn’t enhance your understanding very much, so rather than trying to expand on it, let’s get straight into using the idea. What we first want to do is to work out how much weight there will be on the front and rear wheels - in other words, a vehicle’s weight distribution. This diagram shows a vehicle I was developing. (I subsequently decide to change the design so much the new machine doesn’t resemble this one in the slightest – but it still makes for an excellent example). 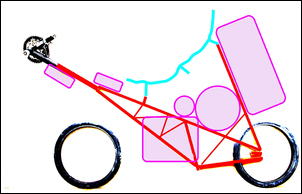 It is a recumbent, human-powered, leaning, pedal trike - but exactly the same ideas apply to any vehicle. Note that in this diagram some bits (like the front suspension) are missing – what I am trying to do at this stage is to work out the weight distribution. In order to do so, I placed on the diagrams the major loads I’ll be carrying (the purple shaded objects). But what about the weight of the occupant and the machine itself? This totals about 110kg, which I’ve shown here (in red) being applied through the base of the seat. The position of this load is a little guesswork and a little experimentation – when I sit in the seat with my feet out in front, my centre of gravity is about at the base of the seat – the seat won’t fall backwards or forwards when I am positioned such. (I have a seat – but not the rest of the machine!) I assume that the centre of gravity of the machine itself is somewhere near its centre point, but since I weigh about 4.5 times the weight of the machine, it’s my weight that dominates. On this diagram I have added vertical lines that show where within the wheelbase the weights apply. Now you can see that the biggest weight (110kg) is closer to the front wheel than the back – so if that was the only weight on board, you’d expect the front wheel to be more heavily laden. But what role, exactly, do the other weights play in determining the front/rear weight balance? It’s an absolutely critical question if you want (as I did in this case) to keep the weight bias a little forwards in all conditions. Now imagine if you could support the machine by just its front wheel. 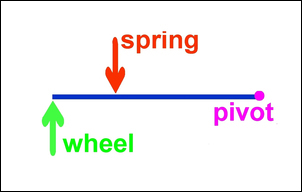 All the loads in the above table would then be trying to rotate the trike clockwise about the pivot point that is the front wheel’s axle. The amount that they are trying to turn the machine clockwise is worked out by multiplying each weight by the distance from the front wheel. 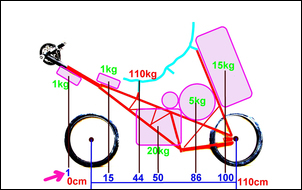 So the second drink bottle is 1cm from the front wheel and weighs 1kg, therefore 1 x 15 = 15. It’s trying to turn the trike clockwise by 15 kg/cm (it doesn’t matter what the units are, just keep them consistent). So a total of 7785 units are trying to turn the bike clockwise. But there’s one load that’s working in the other direction – the front drink bottle that’s 20cm ahead of the wheel. This is trying to turn the bike anticlockwise with a torque of (1 x 20) = 20. Since this is working in the opposite direction to the weights in the table above, we subtract it from that total: 7785 – 20 still leaves 7765 units clockwise. We know that the loaded machine wouldn’t spin around clockwise, even though there are 7765 reasons it should. It doesn’t because the rear wheel is pushing upwards – holding up the weight. So how much is the rear wheel pushing upwards? To keep the machine balanced in forces, it must be pushing up with a force that when multiplied by the wheelbase (110cm) exactly balances the forces trying to turn it clockwise. So we have the formula: 7765 divided by 110 = the push upwards of the back wheel. 7765 divided by 110 = 70.6kg. 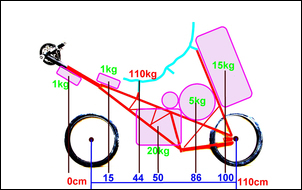 So the back wheel is pushing up with a force of 70.6kg – and another way of saying that is that the weight acting downwards through the back wheel is also 70.6kg. The total weight is 151kg (an extreme for a pedal machine - but you design for extremes!) 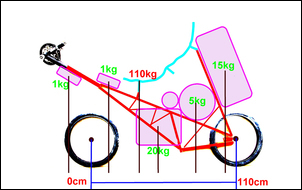 and so the weight on the front wheel must be (151 – 70.6=) 80.4kg. So by taking just the weights, and where and how they act within the wheelbase, we can easily calculate the fully loaded front/rear weight distribution. But what about when the trike isn’t carrying touring gear – it’s carrying just me? This is really easy to work out. 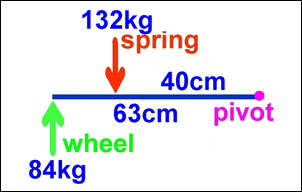 110kg is applied 44 cm back from the front wheel, so the torque clockwise is (110 x 44) = 4840. The back wheel acts against this clockwise torque by developing a force of (4840 divided by 110) = 44kg upwards on the back wheel. With a total mass of 110kg, that gives 66kg on the front wheel. So even with the big rucksack on the back, if the weights are loaded as shown above, more than half the weight remains on the front wheel – with a front-wheel drive machine, what was wanted. When planning a car, it’s easy to then calculate the influence on weight distribution of the occupants, the engine, the fuel tank, an electric motor, batteries – and so on. You can move objects around, juggle packaging, even see how big an engine or electric motor can be used without wrecking weight distribution. All with just some simple multiplication and division. Try working this weight distribution out in any other way! Now that we know the weights acting through the wheels, we can work out some forces on the frame and springs. On this pedal machine, the front suspension comprises a long arm with a spring placed part way along it. Shown diagrammatically, it looks like this. 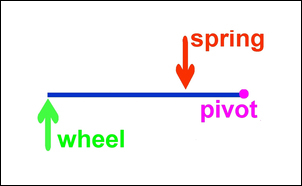 Thinking about the suspension arm pivoting around its, er, pivot, you can immediately see that the wheel is trying to push the arm in an clockwise direction and the spring is trying to push it anti-clockwise. 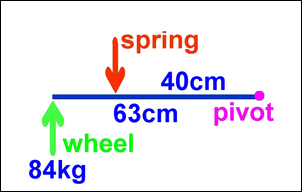 If the wheel is 63cm from the pivot and the spring is 40cm from the pivot, and the wheel has a fully loaded weight on it of 84kg (worked out above), the wheel is trying to rotate the arm clockwise by (63 x 84) = 5292. The clockwise movement is being resisted by the anticlockwise push of the spring, which must be 5292 divided by the length of its lever arm – 40cm. 5292 divided by 40 = 132kg. So we know now that when the machine is fully loaded, there is a push downwards at the spring point of 132kg. If we wanted to see what effect this load would have on the suspension arm, we could build one, support the arm at the pivot and wheel points and then apply a load of 132kg at the spring seat – and see how much the arm bends! We could also say that we’re designing for 1’g’ vertical acceleration (that would double the weight acting on it to 164kg) and then do the experiment with this much greater load applied. Or maybe we’re exploring possible different spring mount locations. Perhaps this position, with the spring closer to the pivot, works better in terms of packaging. 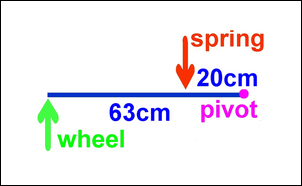 If the spring is now only 20cm from the pivot, the force it develops is 5292 divided by 20, which is 264kg. Design again for a 1g bump and you’re talking about a force of over half a tonne being developed by the suspension of this vehicle, one that weighs a max of just 151kg! At one stage in the design I was looking at using two springs on each suspension arm, each having a different leverage ratio. Using the concepts covered in this article, it was easy to work out that load being borne by each spring. If you know the force that the spring has to support, and how much it should compress when doing so, it’s easy to also work the required spring rates.